Hope everyone had a Happy New Year and a great holiday season! My little one is a year-and-a-half now (can’t believe it! 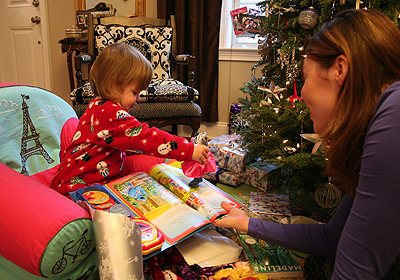 ), so while she still doesn’t really grasp the whole Santa-thing, she did catch on to the present-thing really quick. And of course, there were a lot of books under her tree. Now, Juliet didn’t receive all of the books above. Some were gifts for friends (and there were even more books given that aren’t pictured). 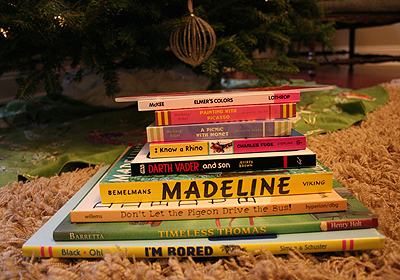 But as you can see, books were a big hit in our house this year. And to prove it, here’s a picture of Juliet opening a Sesame Street book (one of those not pictured above). She was so happy, she even made Super Grover dance on it. I predict another author in the family.